“To properly eliminate messes you have to remove both the cat odor and stain. To eliminate odors we utilize a blend of naturally occurring, non-pathogenic bacteria (like you find in your yogurt) and enzymes whose food source is the animal waste that is causing the stain or odor. Bacteria create enzymes who break all of the waste into smaller pieces so the bacteria can eat them and digest them, leaving nothing behind but carbon dioxide and water. After the waste has been removed the bacteria have no food source so they starve and die. That means no more messes, no more odors, and no left over bacteria. To remove stains we use naturally derived cleaners (detergents) that are safe for your family and home to quickly wipe away the stains. Our product is great for people with old messes because it cleans all the way down to the sub-floor – so those deep, hard-to-reach odors can be removed completely. 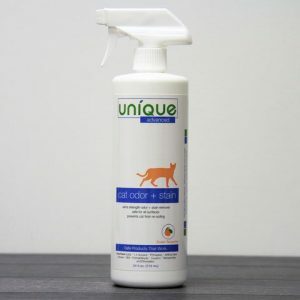 Cat Odor and Stain will remove the toughest odors and stains from all surfaces. We are excited to offer these wonderful products that allow you to clean your home and remove odors without using harmful chemicals and toxins in your environment. Please stop by Varsity Vacuums to see our full line of Unique Cleaners and Solutions.